On behalf of Gelli Primary School's Green Team I would really like to thank you for all of the lids collected. We have had amazing fun collecting, sorting and arranging them into colourful artwork for our school yard. The children have any more ideas they want to do - so please keep sending us your lids! We plan holding our sports as planned this afternoon (July 15th) at Pentre Astroturf. Please can you familiarise yourself with the following arrangements. Pupils will come to school as normal but dressed in their sports kit that morning. Lunch will be at 11.30 a.m. EXCEPT FOR DOSBARTH 1 and 2. We would like parents to pick Nursery and Reception pupils from school at 11.30 and bring them to the Sports field by 12.45. We do not have sufficient staffing to transport them safely to the Astroturf. Other pupils will be walked up by staff, support staff and lunchtime supervisors. Pupils will be dismissed into the care of their parents at the end of the sports. Please will you make arrangements for this as if you are unable to attend and wish family member or close friend to take your child home after the event you can inform us in writing to their class teacher giving your permission. Any pupil not collected will be brought back to school and dismissed from here as normal. There will be a £1 entry fee per adult which we will use towards the running costs of the event. Here is the weather forecast for today for our Post Code area. as you can see there is fine drizzle forecast for early morning which will dissipate by mid morning. There is no rain forecast for this afternoon. There is a similar forecast for tomorrow so I think its best to crack on this afternoon and have our usual well organised, competitive but friendly sports meeting. 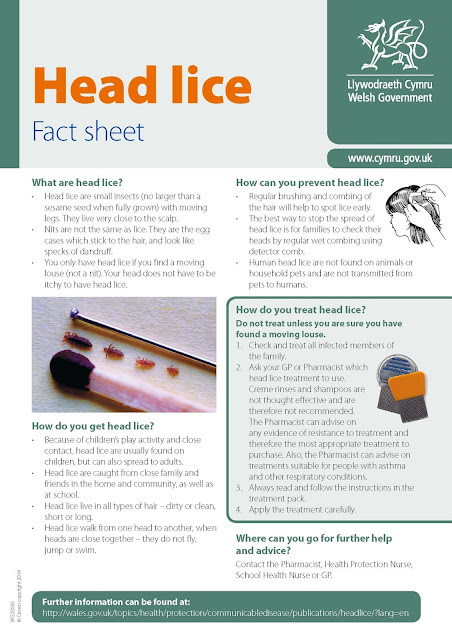 Here is a copy of the latest Welsh Government advice sheet on dealing with headlice. May I remind you that our policy in school is to inform parents (in private) of any signs of head lice in pupils hair. We text parents notifying the class where headlice have been detected. We follow this up with a letter and advise that you seek further advice from the pharmacy or your GP to help you with the treatment. WE ARE UNABLE TO UNDERTAKE ANY HEAD SEARCHES OR OTHER FORMS OF DETECTION.